Hello and Welcome to Fashion Pipes Shop, Your one stop shop for all your smoking needs. We have a vast range of Smoking Pipes, Cigarette Holders and all the relevant products to make your smoking experience ever more enjoyable. Pipes, Tobacco Pouches, Cigarette Holders etc. are all displayed to profusion within our store, with every makers name one can think of. If in the unlikely event you can't find what your after please ask we are here to help. ORIGINAL SMOKING PIPES & CIGARETTE HOLDERS - ONLY IN FASHION PIPES SHOP A cigarette holder is a fashion accessory, a slender tube in which a cigarette is held for smoking. Our cigarette holders can be a wonderful gift to anyone who prize quality and style! 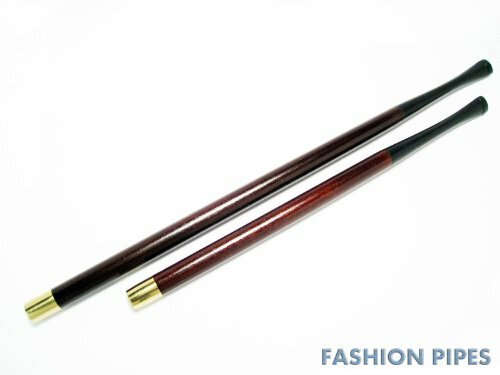 Material: Pear Wood, Ebonite Shading made of quality Italian stained Cigarette Holders "Jacqueline Kennedy" pear wood & brass tip. Measurements & Other Details: Total length: app. 8.7"/220mm & 6.7"/170mm Diameter internal: 5 mm Diameter external: 7 mm FITS SLIM CIGARETTES ONLY! (e.g. Virginia Slims "SuperSlims", Vogue, etc.) The stem is made of ebonite, material that is traditionally used in producing of smoking pipes. Tip - brass ++++++ We guarantee you complete satisfaction with all ours high quality products ++++++ **************************************************** SHIPPING INFORMATION If you have any further question, please feel free to contact us ! The average delivery time for the most countries is 8-14 Business Days. In some cases the delivery can take up to 21 Business Days due to Customs regulations. • Shipping Worldwide from Ukraine • Standard Int'l Flat Rate Shipping • I ship within 24-48 hours after receipt of payment. • The delivery time from Ukraine: 10-25 days. • Item will be qualitatively packed • Parcels with tracking numbers MAKE YOUR CHOICE WITH FASHION PIPES ! ! ! FITS SLIM CIGARETTES ONLY! (e.g. Virginia Slims "SuperSlims", Vogue, etc. !!! If you have any questions about this product by Fashion Pipes, contact us by completing and submitting the form below. If you are looking for a specif part number, please include it with your message.